The red deer and fallow deer rutting seasons, through a unique and exclusive interpretative experience, in a privileged spot in the heart of the Serranía de Cuenca"
The arrival of autumn does not pass unnoticed for Nature-lovers in the Serranía de Cuenca. From mid-September until mid-October, two fascinating wildlife phenomenons happen in our forests: the Iberian red deer (Cervus elaphus) and the fallow deer (Dama Dama) rutting seasons. A chorus of bellowing temporarily disrupts the peace of autumnal evenings in the Serranía de Cuenca, as relentless hymns to life. And at Azeral, we do not want to miss it. We want to witness these gifts of the forest, but not only by sight and sound… During the red deer and fallow deer rutting seasons, we offer you a chance to experience the Serranía de Cuenca —feel it, watch it, and hear it— from the perspective of our protagonists. 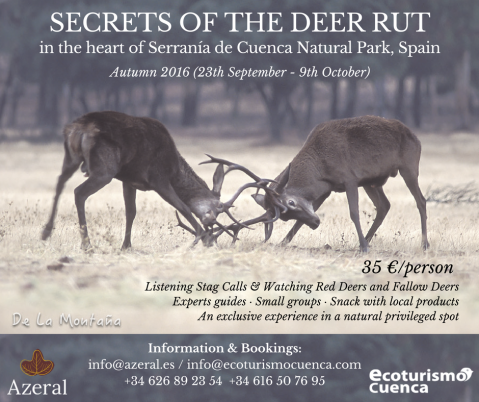 In a privileged spot in the heart of the Natural Park of the Serranía de Cuenca, we have designed a unique and exclusive interpretative experience, with the invaluable support of Ecoturismo Cuenca, named “Discover the secrets of the red deer rut”. This activity is entirely aimed at experiencing and enjoying the red deer and fallow deer rutting seasons like never before in the Serranía de Cuenca, thanks to the agreement with one of the best big game estates in the province of Cuenca, where the sustainable management of game populations promotes the conservation of natural populations of wild ungulates and many other wildlife species. “Discover the secrets of the red deer rut” consists of a guided interpretative hike (about 2 km.) to reveal some of the treasures hidden within the red deer and fallow deer habitats in the Serranía de Cuenca, and then move on to their ruts through an interactive talk (about 40 minutes). What are the red deer and fallow deer ruts? What are they for? What factors determine their onsets and durations? How does the life of a male red deer or fallow deer change during these periods? How do stags and hinds survive this intense period? Why do stags fight? Why do antlers matter? What factors determine the perpetuation of these species? We answer these questions and many more with the support of specifically designed didactic materials. And then, after a well-deserved refreshment, it is time to gaze at our “enchanted valley”, to listen to the voices of male red deer and fallow deer and watch the typical behaviour of males and females during this special periods in their lives. A 5-hours interpretative experience, suitable for audiences of all ages, that combines Environmental Education and Ecotourism principles, leaving none untouched. Are you going to miss it? [Dates: Daily, from 23rd September to 9th October, both included].